This follows on from last week's post on roof spaces. Insulating your loft, as discussed last week, doesn't have to be expensive, and is very cost-effective, paying for itself quite quickly in reduced heating bills. Double glazing is a different matter - it isn't cheap! But it is effective, it increases comfort, reduces energy bills and carbon emissions, reduces noise from outside (when the widows are closed), and increases the value and saleability of your house. I had planned to do both walls and windows this week, but this windows section is quite long enough, I think - walls to follow next week! Double glazing, as well as adding an insulating layer to the glass, usually adds an excellent seal to all opening windows, cutting down draughts and heat loss. I say 'usually' becasue it does depend a little on the type of widows you have. Casement windows, that hinge open, get fitted with a rubber pressure-seal that eliminates draughts completely. However, if you have double glazed sash windows installed, you get the insulating effect of the double glass layer, but you don't get an airtight seal. There are various materials from which double-glazed windows and doors are made. 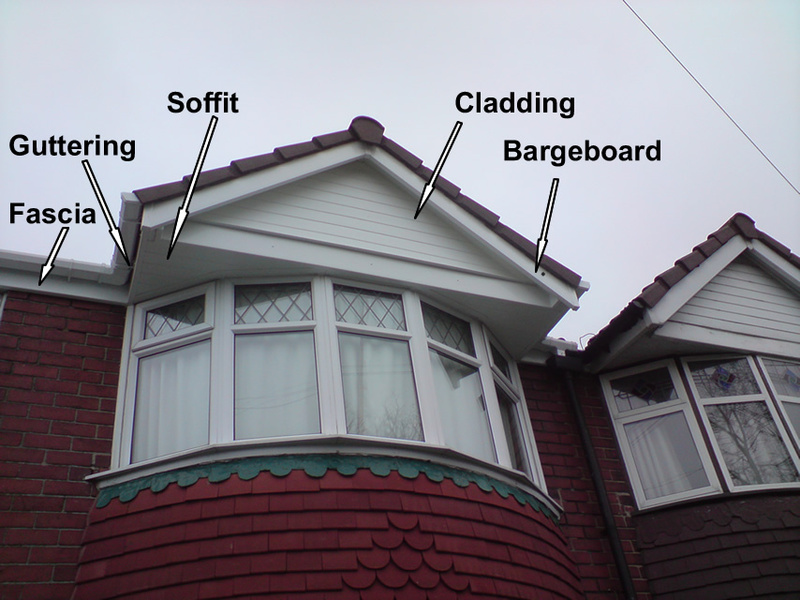 The most frequently seen is UPVC - the white plastic that you see everywhere. Some companies fit wood-framed units, and there are many choices to suit both financial and aesthetic considerations. The more beautiful styles are also - of course - the more expensive. Additionally, if you live in a conservation area, or in a listed building, there will be restrictions on what you are permitted to do - make sure to check with your local authority planning department before doing anything. You don't want to spend a lot of money on expensive double-glazing only to be told you have to take it all out again! If you're considering having double glazing fitted, make sure you get several companies to quote and show you what they would do. We got three quotes - a leading national large company, a regional medium-sized company, and a local sole-trader. The quotes - for doing the same work (windows, front door, sliding patio doors, fascia, bargeboards, gutters and cladding) were, respectively £20K, £15K and £10K (these are prices as they were 10 years ago). The £20K quote was, we thought, excessive. The regional company didn't really want the work, it transpired. They did most of their business renovating whole streets at a time of council-owned properties. The didn't want to do one or two houses. So we went with the sole trader. This meant the work took longer - the age-old problem in the building trade of your contractor vanishing part way through the job to do a piece of work for someone else! So we lived with the scaffolding for rather a long time. Another thing to bear in mind is that the sales/costing methods the companies use mean that the price per window tends to drop, the more windows you have done. I live in a terraced house, and the construction of the whole row is done in pairs of houses - so that the guttering downpipes occur every two houses, the cladding was run across two houses at a time, etc. So my neighbours and I - whose houses form such a pair - had the work done together. We benefitted from reduced scaffolding costs, and greater window discount. The downside was that this also prolonged the work. If they'd been doing my house alone, they would have done front and back, and then finished. The point of doing two houses together was to reduce their costs - and hence ours - so they put one huge run of scaffolding across the two houses. They did both houses at the front, then the did my neighour's gable end (they're the end of terrace), then they did across the back of both houses. So it was quite a long stretch of being surrounded by scaffolding. The other thing to be aware of is that scaffolding isn't kind to your garden. If you have flower beds or shrubbery areas up close to the house, they will suffer. You might like to plan the timing of the work so that you can cut back, or temporarily dig up, vulnerable plants. Equipment will be dumped all over your garden surface - lawn, gravel, or whatever - and booted feet will be tramping around. If you have a lawn, it will suffer . . . but fear not, it will recover. The question of cat flaps! You can have them fitted, but better in an opaque panel than straight into the glass. If your double glazing is well installed, it should be trouble-free, but small glitches can occur in anything - a lock might need replacing, for instance, or your fitted letter-box might break with constant use. Unless it's a major installation fault, be aware that your installers won't be interested in minor repairs - they're already onto other installation jobs, which is where they make their money. But there is now a secondary industry of firms doing minor repairs to double glazing (and sometimes even major repairs to older installations). You'll find them in your Yellow Pages, or Thompsons Local Directory, or you can Google 'double glazing repairs' and the name of your town. There is another option, which is secondary glazing. I'm not going to write at any length about it, because I have no direct experience. It tends to be cheaper, can be visually less appealing and less conventient, but can be thermally efficient if it's done properly. There are several different ways of creating secondary glazing. Some are fully openable, and give you access to existing window latches. Others are fixed - one downside of these is is that you can't open those windows if you want to. So you might find yourself putting the secondary glazing up for the winter and taking it down for the summer . . . this might be a real disincentive! If you Google 'secondary glazing' you'll find lots of information. Also, the BBC's climate change action website has some information on DIY secondary glazing. Once you've got your warm, snug double-glazed (or secondary-glazed) doors and windows, there is one more thing you can do. In cold weather, you will notice that the area near the windows is still colder than the centre of the room - it's still a large area of glass, and there's still some temperature loss. Putting thermal linings in your curtains makes a huge difference, especially as the coldest weather is almost always at night. You can buy thermal lining fabric, or you can buy ready-made thermal linings with header tape. You just gather them in the normal way, and hook them to the backs of your existing curtains. In the winter they keep heat in and noise out. In the summer, if you draw the curtains during the day, they keep heat out and keep the room cool. I have a west-facing sitting-room and bedroom, and I leave the curtains closed during the day in the summer, while I'm out at work. When I come home, the sitting room isn't like an oven, and the bedroom remains cool enough to sleep in comfort. The linings are also 'blackout' so that early morning light through the curtains is reduced in summer, aiding a good night's sleep. Walls to follow next week. I say 'usually' becasue it does depend a little on the type of widows you have. Casement windows, that hinge open, get fitted with a rubber pressure-seal that eliminates draughts completely. Great pointers, Maud! Having your windows double glazed can definitely give you ease in terms of savings and energy efficiency. You can check this site to get multiple double glazing quotations.